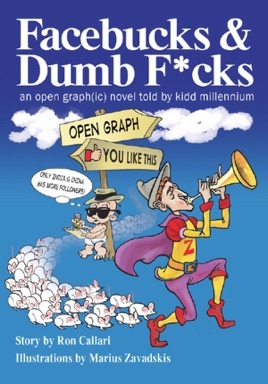 Facebucks & Dumb F*cks is the first graphic novel to tell the tale of the world’s largest social network in living color. This is a satire of Facebook told by the Internet’s enfant pundit, kidd millennium, the unofficial descendant of the “Yellow Kid,” Richard Outcault’s infamous cartoon character of the 19th Century. Journey along with Z-Man (aka Mark Zuckerberg), the self-proclaimed leader of a new social order that’s attracted over half-billion followers! See how an idea incubated in a dorm room backstabbed its way from the ivy towers of academia to the Silicon Valley - in pursuit of creating one of the largest populations of people – more sizeable than most nations! The two-fold meaning of the title underscores the network’s worldview. For starters, it refers to how one social network scaled beyond all others to become its own financial institution complete with the ability to mint its own money. Secondly, it references the multitude of blind faith followers, Mr. Zuckerberg in his early years labeled “Dumb F*cks” when asked how he was able to attract so many. Fact and fiction is interwoven, with a healthy dose of predictions for the future. Check out satire at its best where privacy is sacrificed for a social network that guarantees to make our lives an OPEN BOOK. See how Facebucks overcomes it major competitors, - Gobble (aka Google) and China - to secure dominance over the next evolutionary stage of the Internet, Web 3.0.